Planning to sport enchanting mermaid curls ASAP? With other hot tools, efficiency might be impossible to achieve. 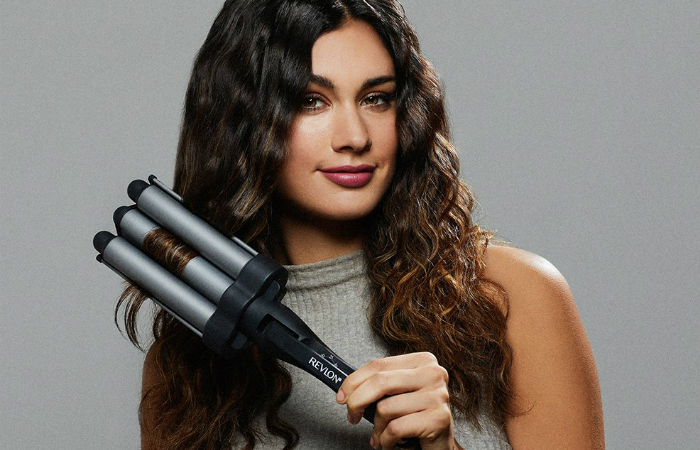 With the best triple barrel curling iron, however, you’ll be able to take your hair game to the next level. To ensure gorgeous waves while keeping your hair smooth and shiny, Revlon Jumbo 3 Barrel Hair Waver has a special design. Its middle barrel is wider than the standard measurement. It aims to shape your hair perfectly and distribute heat safely. Speaking of heat, this device can generate temperatures up to 420 degrees Fahrenheit. Because of that range, it is ideal for all hair types – especially extra-thick hair. It will also help you achieve your desired hairstyle in just a few minutes. To give you a clearer view of how versatile this waver is, we’re going to discuss its settings. Heat levels one to six are for fine, thin hair. In addition, seven to 14 are for normal hair, 15 to 22 for thick hair, and 23 to 30 for coarse hair. Meanwhile, to help you become more efficient, this tool has a swivel cord. It won’t get tangled up, letting you move freely as you style your hair. 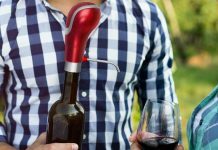 Since storing three barrels seems tricky to pull off, this product has a locking ring. That feature focuses on keeping the barrels together when not in use. Of course, we should also discuss the materials used for this unique curling iron. The barrels are made of tourmaline and ceramic, a powerful yet incredibly safe combination. To know why tourmaline and ceramic are great together, let’s understand the properties and benefits of each material. Tourmaline is technically a kind of crystal that can naturally produce negative ions when exposed to heat. Meanwhile, ceramic can spread an equal amount of heat in a specific area. 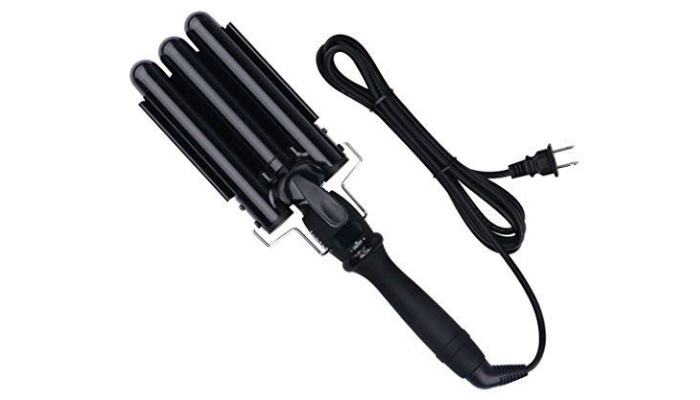 Another tourmaline-ceramic device, Bed Head A-Wave-We-Go Waver is guaranteed to minimize frizz and enhance shine. 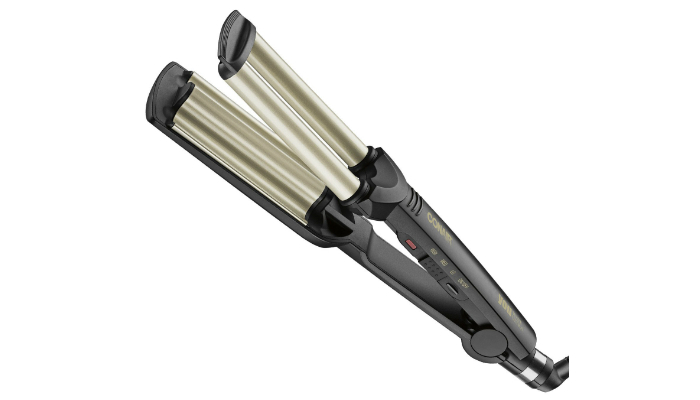 Additionally, its plates are adjustable to help you achieve different wavy styles. You may go for loose waves or tighter, more pronounced ones. Safety should also be a priority. Good thing that this curling iron has an automatic shutoff feature and dual voltage. Dual voltage is crucial if you’re always traveling so you can safely use most electrical outlets. Despite having several levels of heat, this product stays consistent. That’s important when you switch to different temperatures during the process. The feature making this possible is the Instant Heat Recovery system. For better control, the swivel cord measures six feet. You’re free to move around when necessary. 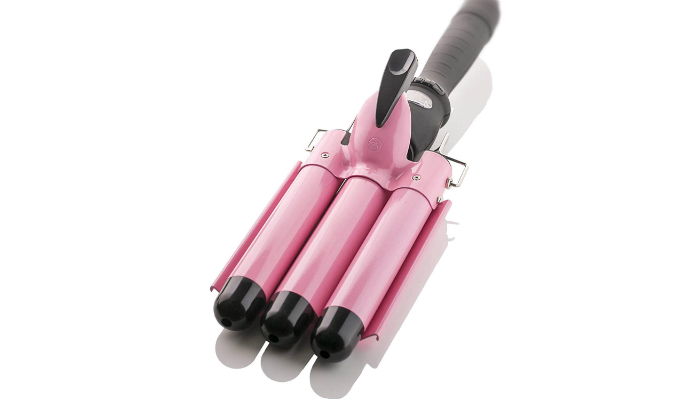 Because of its one-inch barrels, Alure Three Barrel Ceramic Curling Iron can make natural-looking waves. It even has ionic properties. When its ceramic plates are heated, negative ions reach your hair strands to reduce frizz. This device is also one of the most efficient options. It can instantly reach 410 degrees Fahrenheit in just a minute. You can monitor the temperature by looking at the LCD display from time to time. 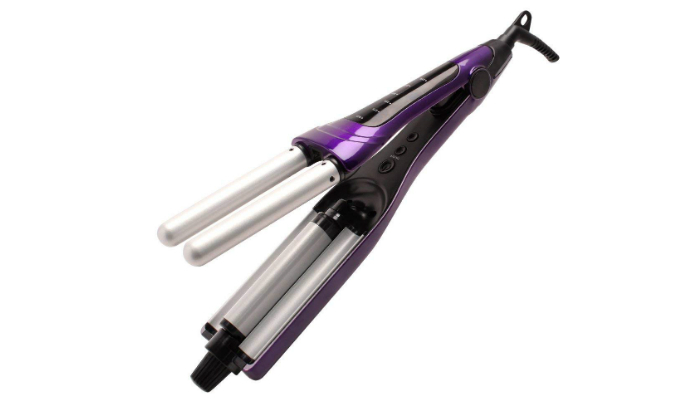 To boost safety, this curling iron has a nonslip grip, lightweight structure, and insulated tips for the barrels. Better control and protective surfaces will protect your skin from burns. When it comes to the materials, the ceramic barrels are covered with Teflon. Teflon gives the barrels strong pH resistance for durability. Taking temperature range to the next level, inkint Three Barrel Curling Iron can go as far as 446 degrees Fahrenheit in just 60 seconds. Don’t worry when the device gets too hot; the tourmaline-ceramic plates will distribute heat evenly. Whether you’re up for beachy waves or vintage glamour curls, this product will give you superior results. It would appear as if your hair is naturally wavy or curly. 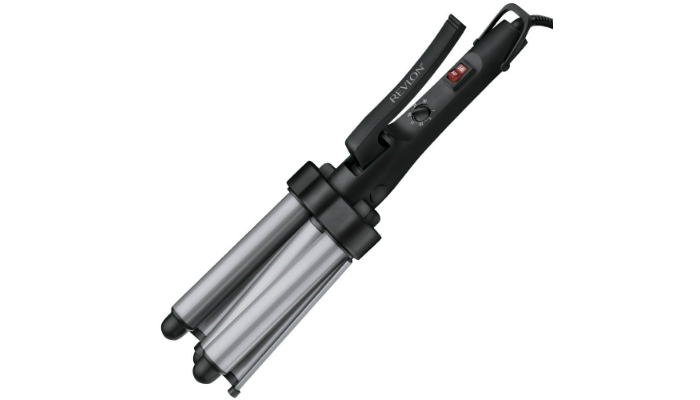 For longer-lasting waves without the expensive price, we highly recommend Conair YOU Wave Ultra Ceramic Styler. Just like pricey choices, it also uses tourmaline-ceramic plates. Even though its maximum temperature is only 356 degrees Fahrenheit, this tool can reach that level of heat in only 30 seconds. As a plus, it has LED light indicators for convenience and safety. Wash your hair two to three days before the process to avoid frizz. Turn on the curling iron. Wait until the plates get hotter. Start with the front part of your hair. Press the three barrels together by pushing the clamp down. Hold the clamp for a few seconds. Release the clamp and move the barrels down to curl the lower part of the section you’re focusing on. Brush the section with your fingers for a more natural look. Repeat Steps 5 to 9 as you focus on other sections of your hair. Seal the deal with hairspray. The disadvantage of using three barrels at the same time is the possibility of an outrageous increase in volume. That’s why the video doesn’t recommend making definite sections around the upper and lower layers of your hair. It only suggests curling the top layer and exposed strands from the bottom layer. After careful consideration, Revlon Jumbo 3 Barrel Hair Waver is the best triple barrel curling iron. It guarantees efficiency, safety, versatility, durability, and convenience. Those benefits are rooted in the product’s tourmaline-ceramic plates and flawless heating system. If you have rebonded hair, you should think twice before using any curling iron. Find out if you can curl chemically straightened hair. Struggling with short hair? Maybe you should stick with ordinary hot tools. Since it can be confusing to choose the right model, check out which one is better for short strands – curling wands or curling irons. Here’s another product you might like. What are the best heat-resistant travel cases for curling irons?